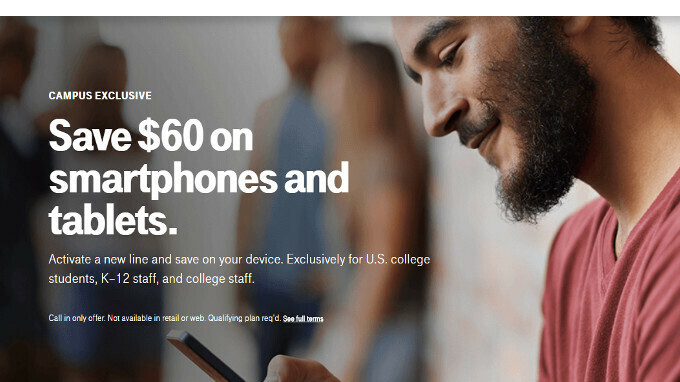 If you're a US college student and you need a new smartphone or tablet, you may want to know that T-Mobile currently allows you to save $60 on select devices, including some high-end models. This also applies to US college staff, as well as K-12 (primary and secondary education) staff. Dubbed Campus Exclusive, T-Mobile's $60 off deal requires a new line and a qualifying plan (while excluding postpaid devices, as well as devices costing less than $240). This is a call-in offer only, meaning it's not available online or in stores. T-Mobile has full details on this on its website - see the source link below. Or, you can just call 1-844-426-8067 to talk to a representative. Unfortunately, the Campus Exclusive offer does not include Apple's latest handsets (iPhone X, iPhone 8, and iPhone 8 Plus), but you can save $60 on the iPhone 7, iPhone 7 Plus, and iPhone SE. You could also choose from many Samsung handsets - including the Galaxy S8 and S8+, but not the Galaxy Note 8. LG's latest high-end phones (like the V30 and G6) are also available. As for tablets, T-Mobile lets you take $60 off the iPad Pro 12.9, iPad Pro 10.5, iPad Mini 4, and more. Wow, this is awesome, I could use this! I can only hope it's in place for me when I decide to. The "add a line" part just kills it. Yup, once you read all the fine print on T-Mobile web page the deal seems quite restricted. However, for those who meet these requirements it's still a $60 savings. Right. I tried to take advantage of this before I finished my term in college, but I was told that I could only take advantage of it if I were to add a new line. I brought over 3 new customers to T-Mobile, and I can't get any kind of appreciation, in addition to being a customer for over a decade. T-Mobile main goal is to increase their subscriber base, everything else is basically irrelevant.